Mike called me on the phone finally, doing his own press and arranging his own interviews. We decide not to do the spiel after the gig, as they'd be "Doin' Stooges" with Ron Asheton at the gig, and Watt anticipated being drained. He tells me he'll be doing laundry the next morning, so we agree to meet there at 8.30. "Got to get up early, else the place is stuffed full of Americans who bogart all the machines," says Watt. 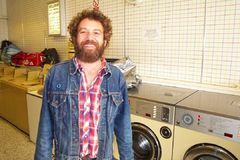 "It's two blocks up from the ho', but it's the only Laundromat". After looking in 3 laundrette's we find him and get down to business.